Q&A: What will be the chances of immigrating to the USA in 2022-23 on a H-1B visa? What will be the chances of immigrating to the USA in 2022-23 on a H-1B visa? Currently I am in BTech 1st yr and wish to settle in the USA in about 6 years. As of mid 2017, the western nations and their leaders are getting to be much more vocal about nationalism and protectionism. US Congress and President Trump are at loggerheads over a lot of issues…. but Immigration reform is one area that will be reviewed during this term. Why? Because it is about jobs and economy. Such ‘reforms’ will certainly include scrutiny of the popular H1 and L1 work Visas. One can only guess if these visas will continue in the same shape and form till 2022 and beyond. Given all this, what would I do if I were young and impressionable youngster like you? I would seriously revisit my stated goal of trying to “settle in the USA in about 6 years on a H-1B visa” What does this mean? Focus on getting the best education one can: in your case, try to graduate at the top of your class/university. Keep in mind that immigration, migrating and ‘settling in the USA’ is not a primary goal, but rather may (or may not) be a byproduct of all this! Why take up ‘sanyas’ when you are worth a fortune? Those with large fortunes continually make headlines. Sometimes the headlines are so radical that one must do a double take. Yesterday, I came across the news article about a “Jain couple to leave minor kid, Rs 100 crore wealth for monkhood.” (link) This story described the intent of a well-educated Jain couple from the Indian state of Madhya Pradesh who have decided to leave behind their three-year-old daughter and property "worth Rs 100 crore" (over $ 15 million) to embrace monkhood (‘sanyas’) under the 'Shwetambar' (white clad) order of their religion. 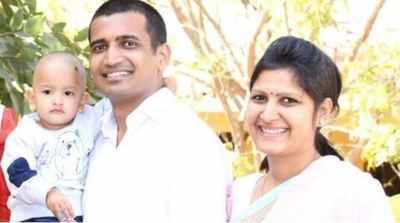 Sumit Rathore (left) and wife Anamika with daughter. (Source: Facebook profile of Yatindra Kush Tyagi). We have all heard of billionaires and millionaires announcing plans to give away a large part of their fortunes to charity during their lifetimes. Notable are stories like that of "Bill Gates gives $4.6bn to charity in biggest donation since 2000." or "Mark Zuckerberg Vows to Donate 99% of His Facebook Shares for Charity" and Jeff Bezos taking to social media seeking ideas for his "philanthropic strategy"
This story of Sumit Rathore and his wife Anamika, however, is a bit different. They have a net worth that most other Indians can only dream of. However, it is also different from that of Bill Gates and Mark Zuckerberg since it is not about charity, but rather renouncing everything. Which brings us back to the question: Why take up ‘sanyas’ when you are worth a fortune? Of course, Sanyas has little to do with high-networth but rather about one’s mindset in taking up sanyas, renouncing worldly pleasures, wealth and more importantly a young family with potential. Their reasons for the move are unclear, and my guess is as good as yours; but it may be simply because Sumit and Anamika can! In case you are wondering, my personal views on religion, charity and Indian culture continue to be reshaped based on my experiences. I am content being a mere ‘karma yogi,’ engaging with life and society while actively engaging in my Karma without renouncing much. Q&A : How and why do top intellectuals go back to teaching jobs? An interesting question came to me from an online forum: How and why is teaching in US universities so fulfilling that top intellectuals like RBI governor Raghuram Rajan and Niti Aayog vice chairman Arvind Pangariya went back to join teaching? Fascinating question but one doesn’t have to think too hard about How and Why. The names you quote Raghuram Rajan, Arvind Pangariya et al. are globalized intellectuals with impeccable credentials, stellar education backed by real world experience. Arvind Panagariya happens to be Princeton educated Indian American. He was previously Chief Economist at the Asian Development Bank. “In the past, he has been a professor of economics at the University of Maryland at College Park. He has also worked for the World Bank, International Monetary Fund, World Trade Organization, and the United Nations Conference on Trade and Development (UNCTAD). He holds a Ph.D in economics from Princeton University.” Same goes for Mr. Rajan with his excellent credentials - IIT Delhi, IIM Ahmedabad, MIT Sloan School of Management (PhD)! Having a global background like these also means they are unencumbered by trivialities like visas and immigration restriction that may apply to rest of the junta. How do they do it (i.e make a switch)? These are the guys whose phone calls will be picked up by any ivy league university Dean or multinational CEO. These are the guys who are continually tracked by elite executive headhunters. Why do they do it (i.e make a switch)? Now, this is a subjective part of the question. If you had the credentials like Raghuram or Arvind and the ability to write your own agenda, and chalk a path after every milestone, wouldn’t you do it? Some of these people like Raghuram and Arvind have excellent academic credentials. Academics in in the US, especially in top schools/universities are well respected, and depending on seniority and tenure, the pay and perks are great too. In addition, professors get to focus on research and consulting outside the university too!